When I was younger, much, much younger than I am now, I wasted many hours of my life playing Solitaire, that little game of Patience that is included in some popular operating systems. To be exact, I wasted about 90 minutes per week on it, because that’s how long our computer lab lessons lasted in school. But even back then, I was pretty clear that “game” was not the right term for it, it was a solo exercise in frustration, a pastime at best. So imagine my surprise when I discovered a game by Bruno Cathala and Ludovic Maublanc, two game designers who’s work I have always enjoyed, that claimed to be a multiplayer solitaire with a theme. Given the title, I probably don’t have to say much about the theme. SOS Titanic is set in the fateful night of August 15th 1912, the night the RMS Titanic sank. Just as unsurprisingly, your job is to rescue as many of the Titanic’s passengers as you can. And that you actually do by playing Solitaire with them. Only not necessarily solo, you can enlist the help of up to four friends to do what the original crew failed to do: save everyone! Because some nights, everyone gets to live. But don’t get your hopes up yet, there’s work to do before you get there. At the start, just before the iceberg viciously jumps your good ship, everything is nice and orderly, just like you know it from regular Patience: Passenger cards are arranged in four lines of different lengths, only the bottom card of each line is turned face up. Towards the ship’s stern, two more lines are available but empty to start with. 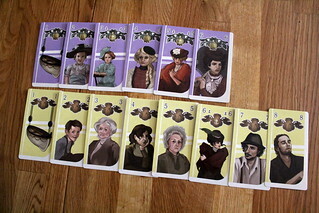 For the first part of each player’s turn, you do the really solitaire-y thing: move cards around. The rules for that are easy and familiar: you can move a card from the bottom of a line to the bottom of any other line if both cards have the same color (yellow or purple in SOS Titanic, representing 2nd and 1st class passengers) and if the value of the card moved is exactly one lower than the card it is being moved to. Two cards thus brought together can be moved together. When moving a card reveals a card that is still face down, you turn it over. The two initially empty lines can only be started with the highest value in a color (13 for 1st Class Purple, 17 for shabby 2nd Class Yellow). Still like regular old solitaire, once you find a one in a color you can set it to a side and then start piling cards with higher numbers on them. Ones are the lifeboats and any card that you can put on a lifeboat is safely off the ship. If it has the right color, of course. If we didn’t know that the Titanic left from Great Britain, we’d have two hints to that fact at this point: even with their lives at stake, the passengers form orderly lines, and even in the lifeboats they make sure not to mix the classes. After the card reordering, we get to the part that is less like plain, old solitaire. For the second part of your turn, you have two options: try to rescue more passengers or play action cards. When rescuing passengers, you draw cards passenger cards from the stack and hope to god that one of them fits in one of the lines, because if it doesn’t you turn the page on the game board. Wait… turn the page on the game board? You heard that right, the game board has pages. Actually, it’s not so much a game board as it is a coil bound game book, and with every page you turn the Titanic sinks a little bit more. So not drawing a card that fits anywhere makes the Titanic sink. Fortunately, you get to decide how many cards you draw, from one up to your character’s maximum. Drawing more cards increases your chance to find a matching card and not turn a page. On the other hand, it makes you go through the passenger draw pile more quickly, and when it runs out and you have to reshuffle it, you also turn a page. See, that’s what all solitaire games where missing so far: interesting decision, spiced up with a bit of dilemma. Turning the page is doubly bad, by the way. 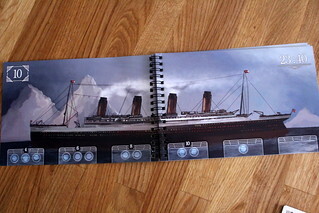 Not only does it bring the Titanic closer to a watery end, every few pages you also lose the space for one line of passenger cards. When that happens and there are still cards in that line, you shuffle them into the next line, turning all the cards from both lines face down again and only revealing the bottom. That’s what happens when the passengers panic and storm into the next compartment, they destroy your painfully arranged order in the cards. But at least not drawing matching cards has its compensations, and they are where SOS Titanic leaves Solitaire behind for good. When you cannot place any of your drawn cards, you receive an action card that can be used on later rounds instead of drawing passenger cards. Using those action cards right is were you sink or swim, if you’ll excuse that tasteless cliché expression. There are cards that let you look for and play one card in the draw pile or the discard pile, perfect for finding that one card you need to fill a gap. Other cards let you look for more suitable passenger in one of your card lines and move him to the bottom – with the useful side effect that you now know what other cards are in that line. There is even a Collapsible Boat that lets you begin another line of passengers that doesn’t have to start with the highest number in that color. The action cards are quite powerful, so make sure you use them well. Another powerful ability are the different character powers. 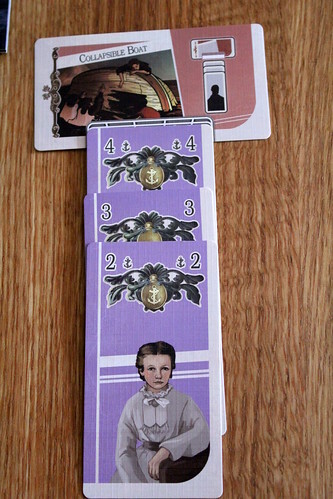 Every player draws a character card at the start of the game that not only tells him how many action cards he starts with and how many passenger cards he may draw, it also comes with a special ability. The character cards are sadly not as well balanced as they could be, some abilities are simply much powerful than others. 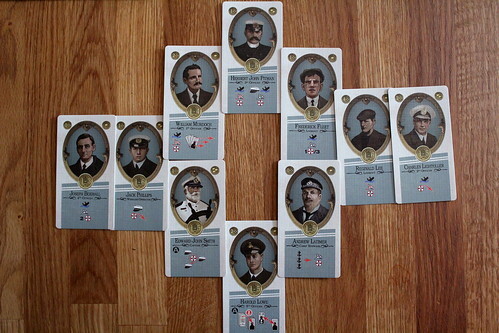 For example, Chief Steward Andrew Latimer may draw an action card every time there are exactly three passengers with an anchor icons grouped together in a lifeboat. That’s nice and all, but it doesn’t happen all that often, and if you’re playing for points making groups of only three anchors will reduce your score. Compare that to First Officer William Murdoch’s ability to play all matching cards you have drawn from the pile, instead of just one like everyone else, and he is more useful, plain and simple. The number of players also changes the game’s difficulty noticeable, more players generally makes SOS Titanic easier, probably because you have more special abilities and more action cards at the start of the game, with no added difficulty to balance that. That is my one big issue with SOS Titanic, the level of difficulty varies widely depending on the aforementioned factors. To give you an idea, we have yet to stage a complete rescue with two players while we managed to get everyone into the boats and safely back to shore the first time we ever played in three – admittedly with lucky character draws, but that doesn’t make it better. Luck simply plays a big role in this game, and even the action cards don’t always make up for having all the lifeboats hidden face down in a line somewhere. But that’s okay, this is not Pandemic or Ghost Stories, SOS Titanic is a much quicker and ligher game than those two, and it still does give you options to overcome bad luck. Strategic thinking, a good memory which card you saw where and a healthy ability to assess risks do go a long way in this game. Just not always far enough to save everyone. Sometimes you have to content yourself with saving more people than last time. That is, if you want to keep playing for a better score, because after a few games it does get repetitive to move cards around, and just getting better but not “getting there” is not as fulfilling as winning. Nevertheless, the courageous experiment to make Patience into an actual game where you communicate with other players and make actual, meaningful decisions worked. A multiplayer solitaire with super powers worked much better than I thought it would, and makes it clear that a good team of designers can take a lonely and boring pastime and turn it into a fun group activity. That feat alone deserves the spot in the Spiel des Jahres jury picks. And who knows, you might just be able to use SOS Titanic to get your elderly family members who enjoy their Patience into real games.